Pre-season continued on Thursday night in Stevenage. I was delighted when my final meeting of the day finished early, so I was able to make a quick getaway. Not so pleased to find that my card wouldn’t work in the ticket machines and the trains were delayed. Thankfully, a late running train left at the time that I had intended to leave and I was in the pub in Stevenage in plenty of time to meet my companions and have a swift pint or two. After a dissection of last season and the Euros, we left for the ground. Having thought that we had left plenty of time before kick-off, we were a bit shocked to arrive at the turnstiles to see huge queues and realize that having pre purchased our tickets was not going to speed our entry to the stadium. I hate being outside the ground and hearing the whistle go for kick-off, but we were soon inside and took our place in a packed away stand. Catching up on the team news, I noted that the conspiracy theorists would have been pleased (disappointed?) to see Deeney in the starting line-up replacing Vydra. The starting XI was Gomes, Nyom, Britos, Hoban, Amrabat, Capoue, Suarez, Berghuis, Holebas, Deeney and Ighalo. The first half was standard pre-season fare, although Watford did create the best of the chances. Ighalo had a couple of shots cleared off the line, one of which had he and Deeney in a long discussion with the referee trying to convince him that a hand had kept the ball out of the net. Capoue also had a couple of decent chances but, in usual fashion, the shots didn’t trouble the goalkeeper. The referee was allowing the players to get away with some rather robust tackles, which had the consequence that the challenges were getting worse and worse as the half went on, culminating in a nasty looking scissor challenge from Berghuis on Fox that resulted in a spot of handbags. It was the home side that had the last chance of the half with a shot from Godden that flew just over the bar. Watford made four changes at the start of the second half, bringing Arlauskis, Anya, Doucouré and Guedioura on for Gomes, Amrabat, Suárez and Berghuis. The visitors opened the scoring early in the second half. I was quite glad that I wasn’t sitting behind the goal at this point as seeing Capoue shape to shoot would likely have meant that I would have ducked and missed the goal. 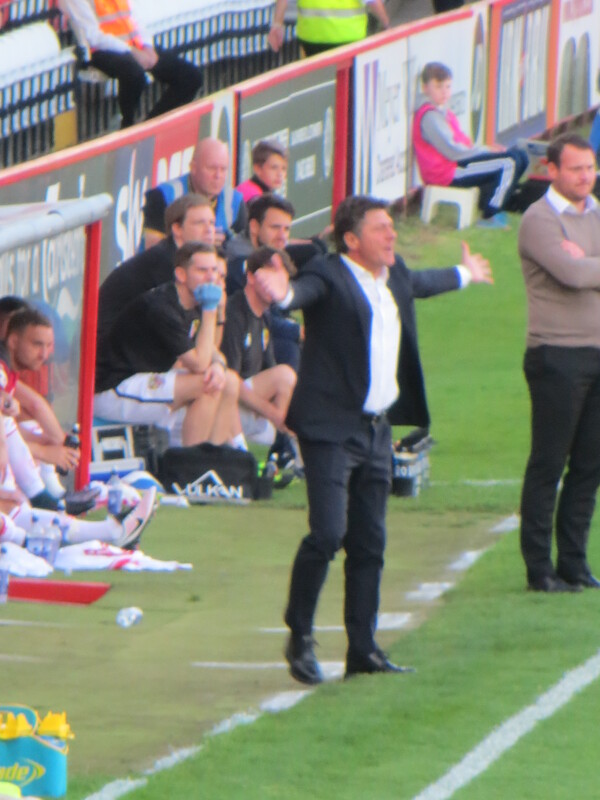 Instead I was in prime position to see him curl a gorgeous shot past Jones in the Stevenage goal. The hearty rendition of his song stumbled a bit when it got to “Quique’s man”, but we recovered. The second half was terrific entertainment. Watford had chances to increase the lead as Ighalo hit the bar and Deeney was left smiling ruefully as his shot came back off the far post. 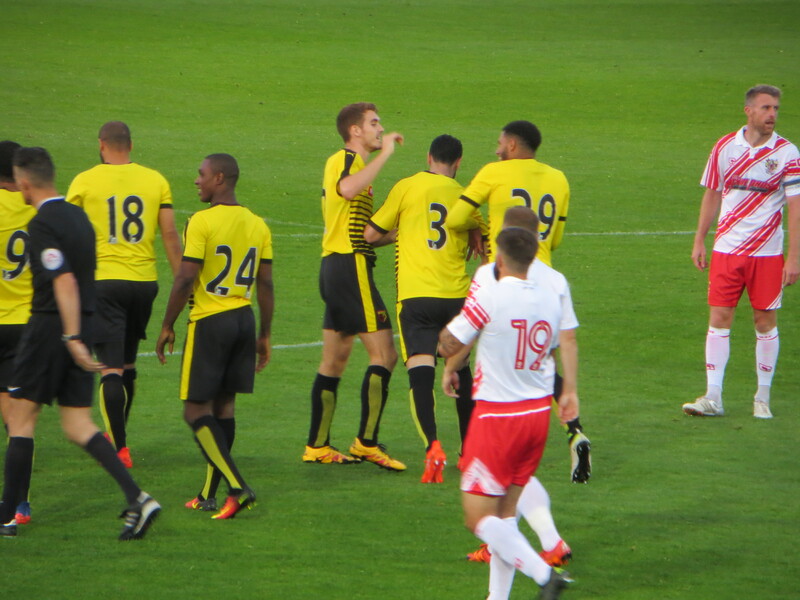 Sinclair went on a lovely run before crossing for Deeney, who was frustrated again as Chris Day, who had come on as a substitute, blocked the shot with his feet. Finding out that Chris is now a veteran of 40 makes me feel very old indeed. I remember a very young Chris presenting me with a cheque on the pitch when I won the Hornets lottery. It is very hard to believe that was nearly 20 years ago. It wasn’t all Watford and Pett had a decent chance to level the score with a shot from the edge of the area, but Arlauskis was equal to it. The Hornets made certain of the victory in the last minute of the game when Sinclair headed home a lovely cross from Abdi. So a perfect pre-season game. A very entertaining performance on a lovely Summer evening with a couple of goals to savour and a chance to become more familiar with some of the new boys. The more I see of Doucouré, the more I like him. He has described himself as a box to box midfielder, which was every apparent in this game and he has a lovely touch. Sinclair again looked lively and, this time, found the net. But man of the match was Capoue who put in a typically assured performance topped off with a lovely goal. Now that he has broken that duck, I hope he is a regular on the scoresheet. It is early days but this team is shaping up to be quite formidable, which bodes well for the new season. 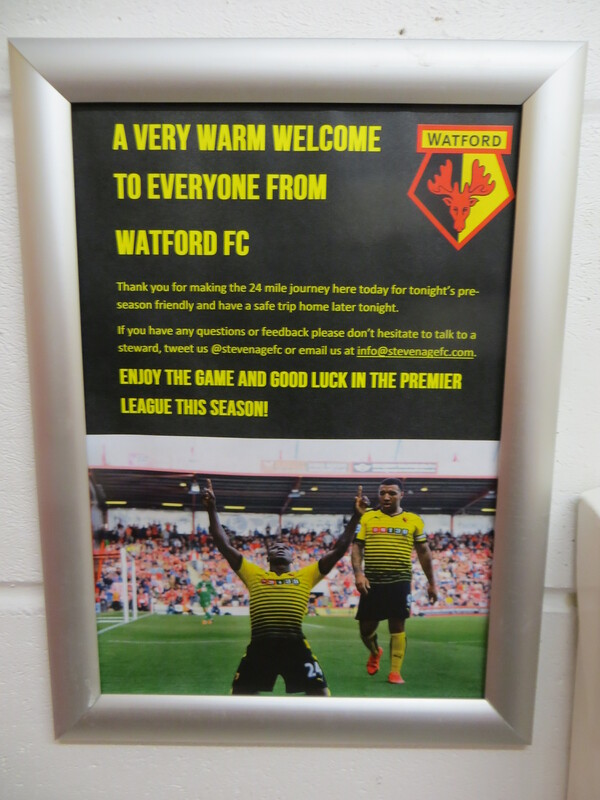 This entry was posted in Watford FC and tagged Abdoulaye Doucoure, Adlene Guedioura, Allan Nyom, Almen Abdi, Chris Day, Etienne Capoue, Giedrius Arlauskis, Heurelho Gomes, Ikechi Anya, Isaac Success, Jerome Sinclair, Jose Holebas, Mario Suarez, Matej Vydra, Miguel Britos, Nordin Amrabat, Odion Ighalo, Steven Berghuis, Stevenage FC, Tommie Hoban, Troy Deeney, Walter Mazzarri, Watford FC on July 17, 2016 by franelynn.